6142 97AXbav 12 Pfg. Dark brownish red on yellowish gray, fibrous paper. 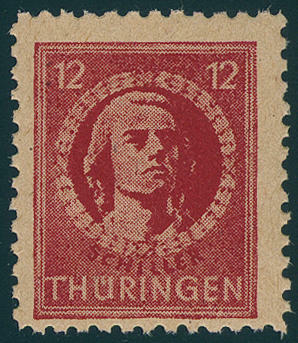 The stamp luminous under ultraviolet light dark brown red. An extremely scarce color variety, wonderful fresh colors and very well perforated, in perfect condition mint never hinged in perfect condition. Photo expertize \"genuine and immaculate\" Ströh BPP. Michel 3600,- €. 6143 ✉ 97AXbp2,97AX 12 Pfg. 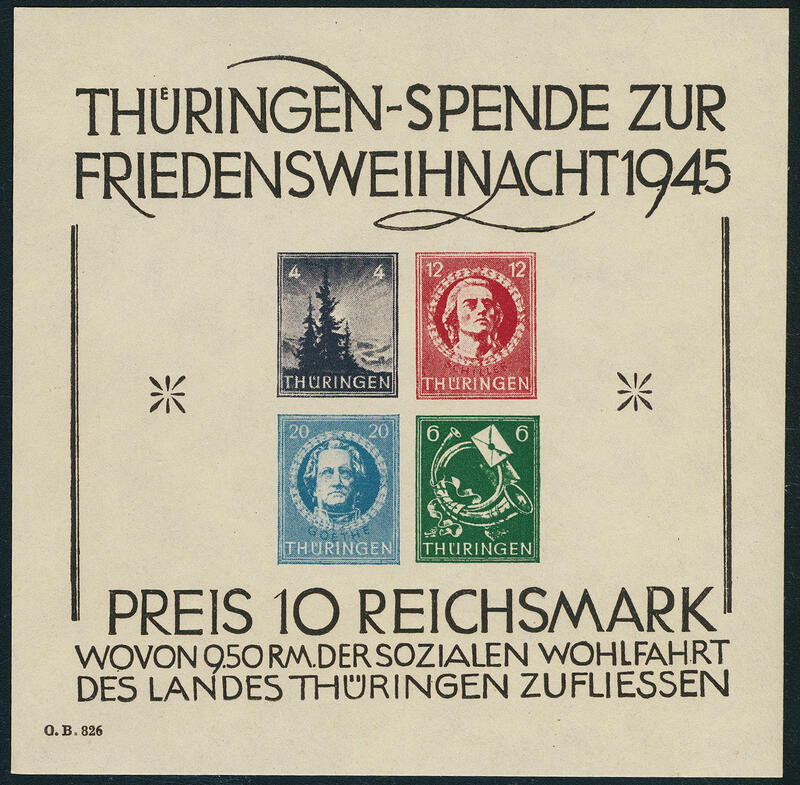 Schiller, spectacular pure mass multiple franking of 10 copies, front- and reverse, in perfect condition, a value near the affix corner bent, on complete package card from \"KÖPPELSDORF 30.3.46. 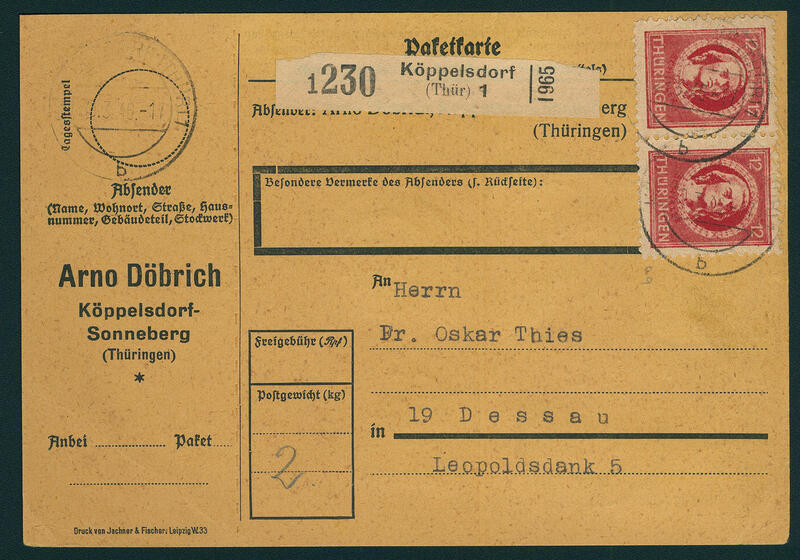 \", correctly franked used to Dessau. 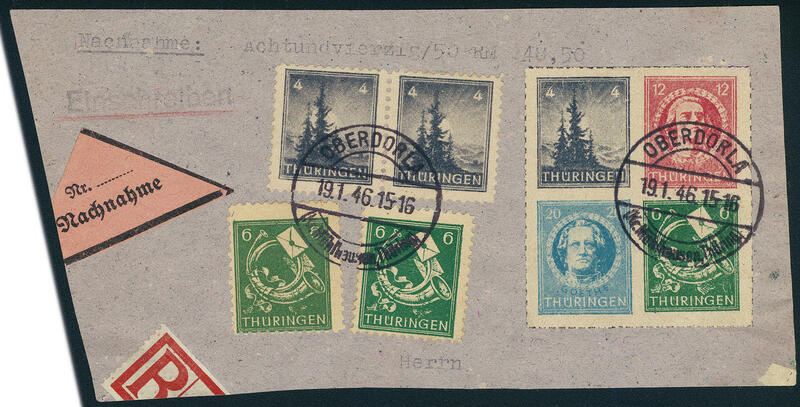 An especially impressive and extremely scarce franking, in this kind a Soviet Zone rarity! Photo expertize Ströh BPP. 6144 98/99BYySKZ 20 Pfg. 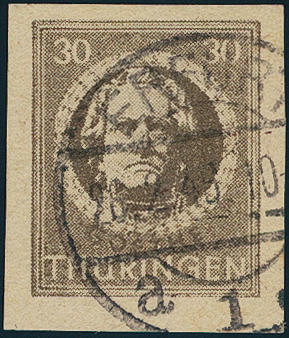 - gutter - 30 Pfg., vertical tête-bêche pair with gutter, cut, fresh colors, unfolded and in perfect condition mint never hinged an outstanding quality this Thuringia rarity! Photo expertize \"genuine and immaculate\" Ströh BPP. 6145 98/99BYySKZ 20 Pfg. Prussian blue and 30 Pfg. Dark olive gray in the vertical tête-bêche pair with gutter, type of paper y, fresh colors and large margins all around, unfolded, in perfect condition mint never hinged in utterly perfect condition. These tête-bêche pairs were over the philatelic agency in Erford sold and samples postally valid. Especially in this exceptional quality extraordinarily rare! Photo expertize \"genuine and immaculate\" Ströh BPP. Michel 1400,- €. 6146 99BXaw 30 Pfg. Dark olive gray, rare yellowish, thick paper with coarser network structure, in perfect condition mint never hinged, photo expertize \"genuine and immaculate\" Ströh BPP. 6147 ⊙ 99BXaw 30 Pfg. Dark olive gray, thick, yellowish paper with coarser network structure, fresh colors and with wide margins, fully gum coating, very nice canceled \"Erford 26.2.46. \", of an of the most beautiful known examples this very rarely type of paper, photo expertize \"genuine and immaculate\" Dr. Jasch BPP. 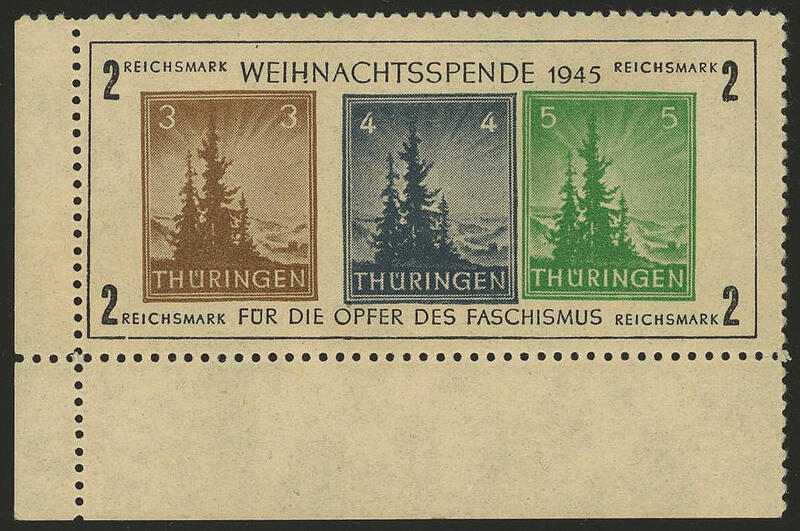 6148 Bl.1xaV Small Christmas souvenir sheet 1945 on white paper, left lower corner of the sheet with extremely rare variety \"4 PFG. About 1, 6 millimeter to the right shifted\", fresh colors and very well perforated, in perfect condition mint never hinged there are only few examples of this variety have become known! Photo expertize \"genuine and immaculate\" Ströh BPP. 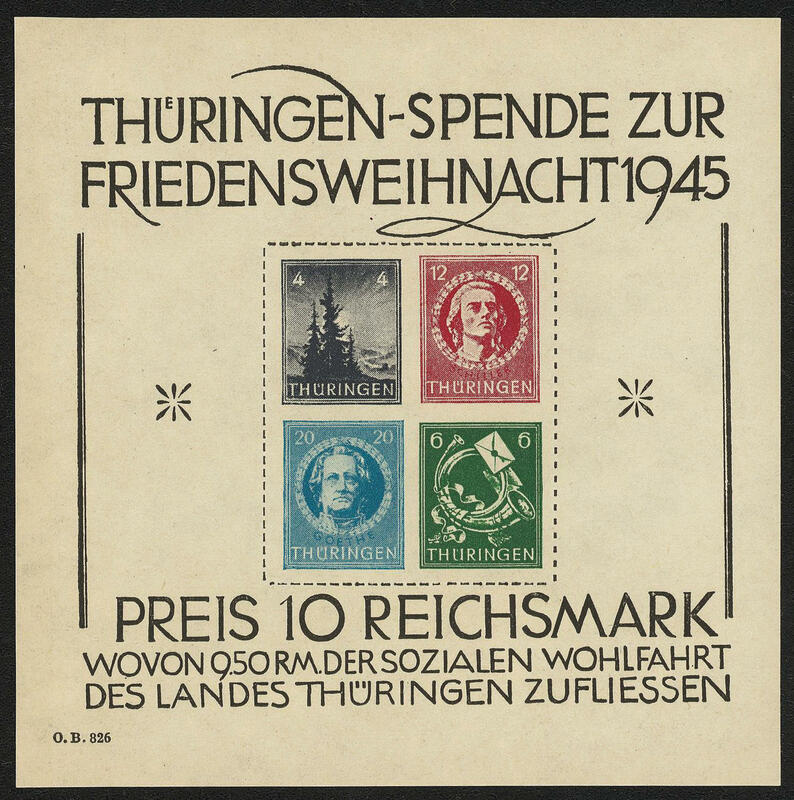 6149 ∆ 103/06t Christmas 1945, souvenir sheet center piece on yellowish gray paper, fresh colors and in perfect condition with additional franking on piece, neat and clear used \"OBERDORLA 19.1.46. \", photo expertize \"genuine and immaculate\" Ströh BPP. Michel 1200,- €. 6150 Bl.2x Large Christmas souvenir sheet 1945 on white paper, fresh colors and in original size, in perfect condition mint never hinged photo expertize \"genuine and immaculate\" Dr. Jasch BPP. Michel 2300,- €. 6151 Bl.2S Large Christmas souvenir sheet 1945, the very scarce special print without roulette on white paper, wonderful fresh colors and in full original size, in perfect condition mint never hinged in perfect condition. In this excellent quality a SBZ-rarity. Photo expertize \"genuine and immaculate\" Ströh BPP. Michel 4500,- €. 6152 107VCL 6 Pfg. 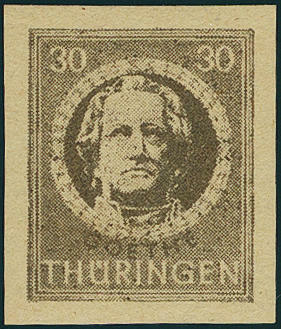 Schiller 1946, reference print in dark gray brown from upper margin of sheet with left two attached blank fields, perforated 13:12 1 / 2, in perfect condition mint never hinged these reference prints were from of the Regional Directorate of Posts Erford for a possible further printing presented, but not accepted. Already single are these reference prints very rare, with blank fields is an important Soviet Zone rarity! Photo expertize \"genuine and immaculate\" Ströh BPP. Michel 3000,- . 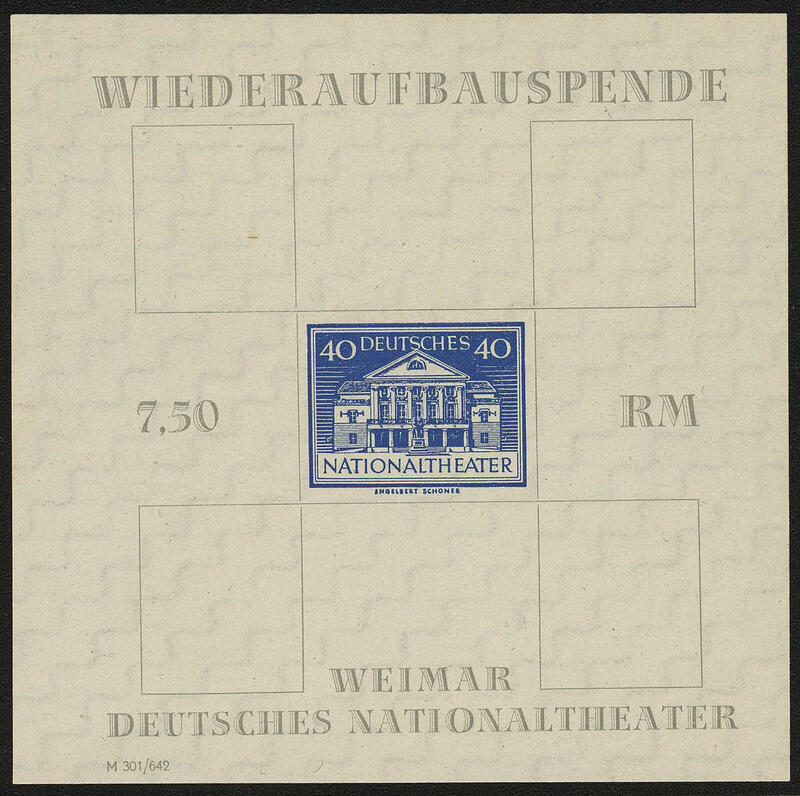 6153 Bl.3AXDGKIII National theater souvenir sheet 1946 on white paper, with spectacular variety \"6 PFG, 10 PFG, 12 PFG. And 16 PFG. Once again inverted reverse printed, the 40 PFG. Stamp is absent\", fresh colors and in perfect condition mint never hinged, as issued without gum in original size. From of this variety are very few examples have become known, the to the large rarities of the SBZ count. Photo expertize \"genuine and immaculate\" Ströh BPP. 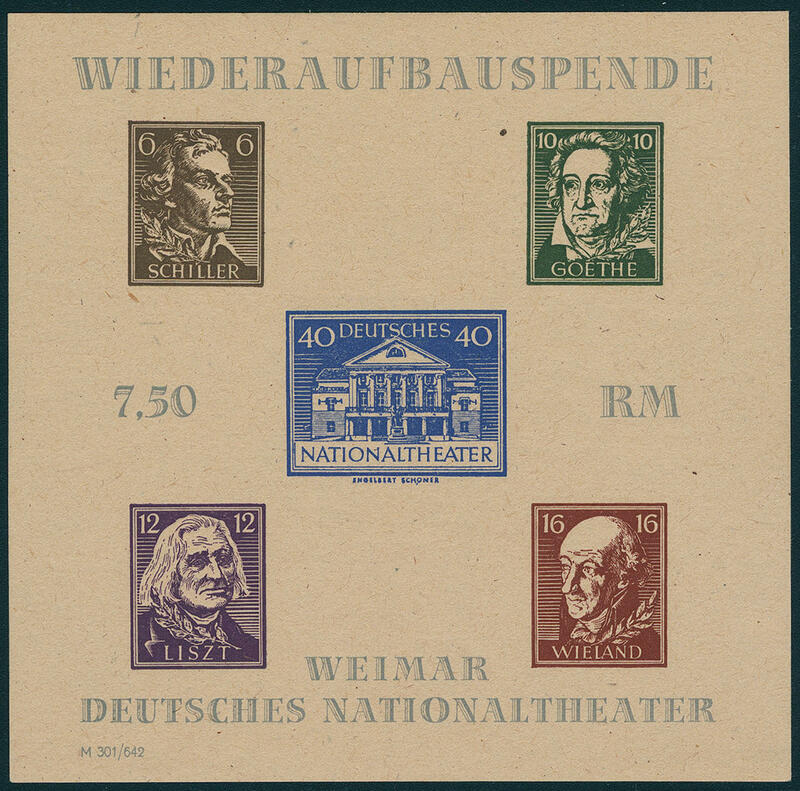 6154 Bl.3AXFII Theater souvenir sheet 1946 with spectacular variety \"missing denomination value 6 PFG, 10 PFG, 12 PFG. And 16 PFG. \", these are only in the blind embossed visible, fresh colors and in full original size, in perfect condition mint never hinged, as issued on ungummed white paper. An outstanding quality this SBZ-rarity, of the only a few copies became known are! Photo expertize \"genuine and immaculate\" Ströh BPP. 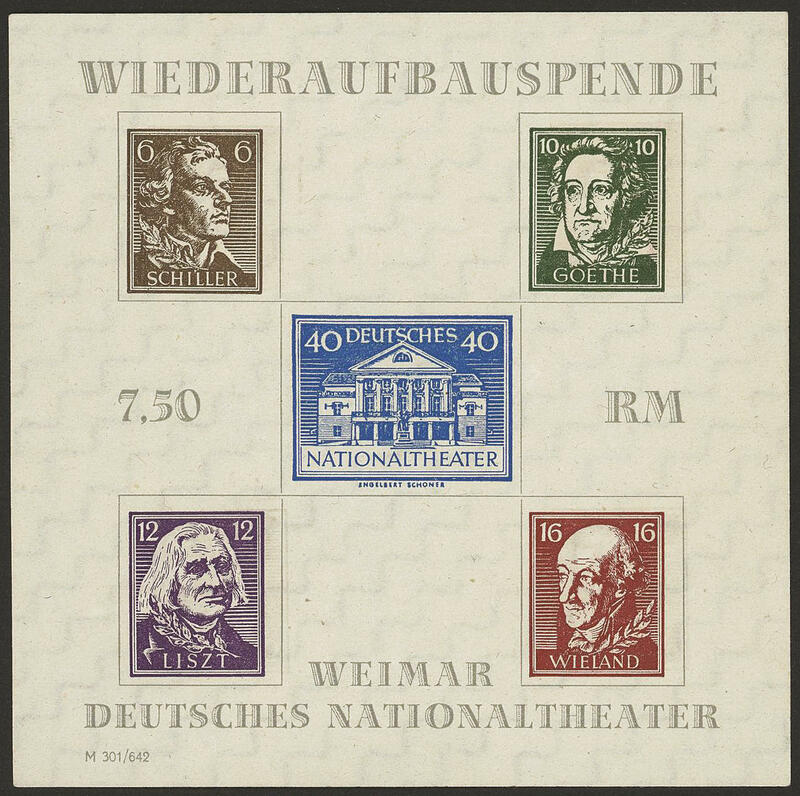 6155 Bl.3AY National theater souvenir sheet 1946 with extremely scarce watermark \"steps increasingly\", wonderful fresh colors and in original size, in perfect condition mint never hinged as issued without gum in utterly perfect condition. 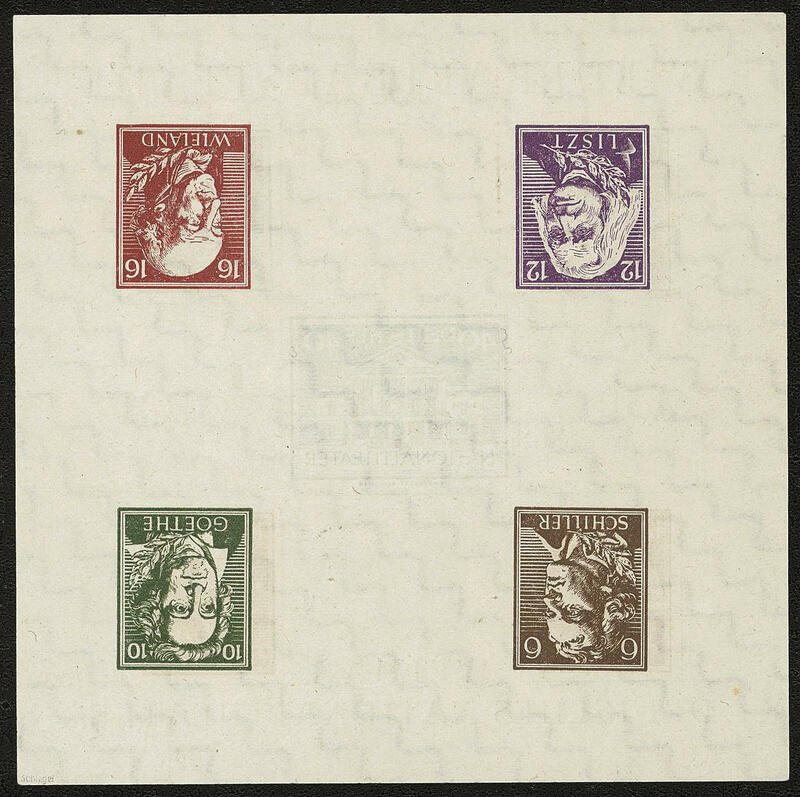 This souvenir sheet belongs to the largest rarities of the SBZ and is absent in almost all collections. To to the year 2009 samples only five examples hereof known. This is of an of the most beautiful known pieces and a Honor for the sophisticated special collection! 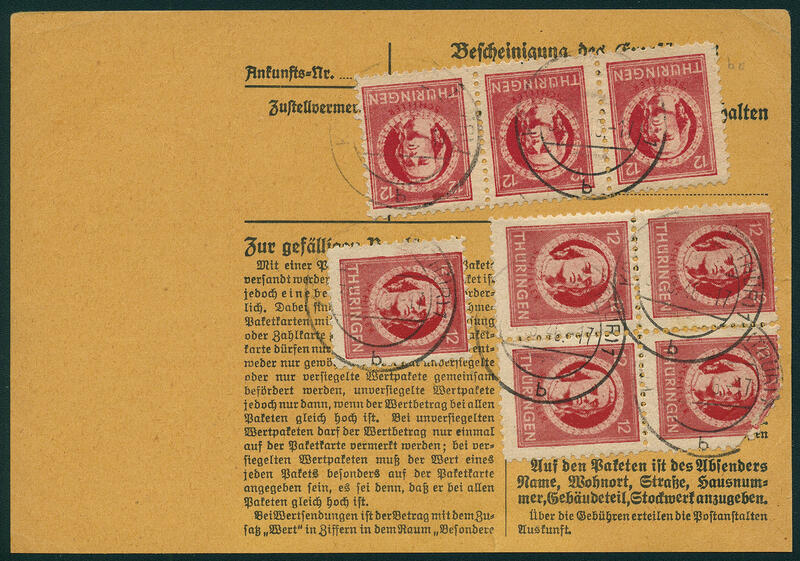 Mr. Ströh writes in his photo expertize \"souvenir sheets of this kind to class among the all large rarities of the SBZ\". Photo expertize \"genuine and immaculate\" Ströh BPP. Michel 30000,- €. 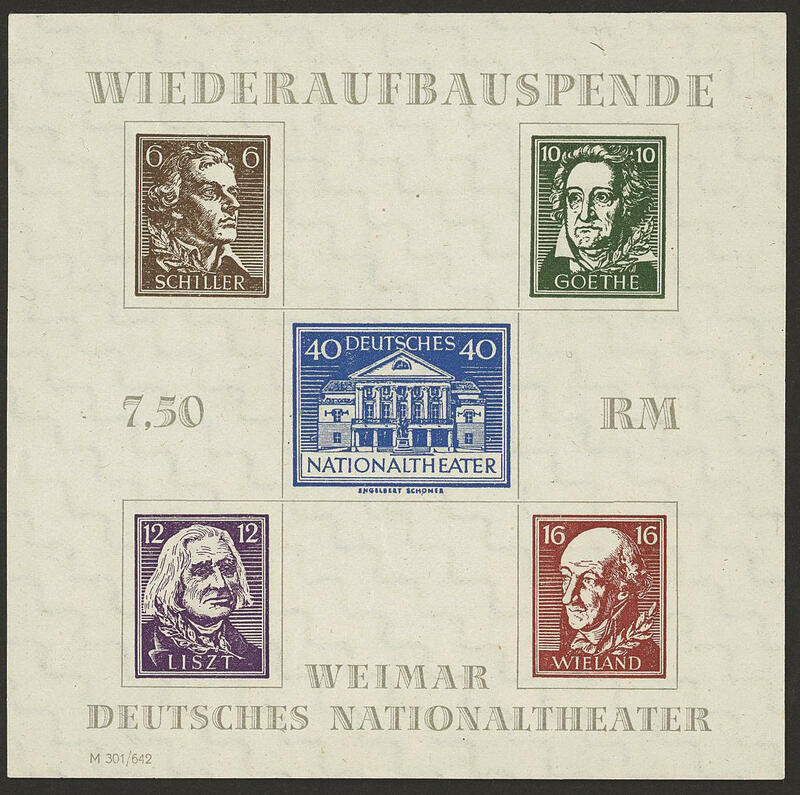 6156 Bl.3BayaFIIU National theater souvenir sheet Weimar 1946 on yellowish, thick paper with rare variety \"without roulette\", fresh colors and in original size, in perfect condition mint never hinged in perfect condition. There are only few examples from this known! Photo expertize \"genuine and immaculate\" Ströh BPP. 6157 112P 10 Pfg. Bridges building 1945, proof in dark reddish brown on gray paper with fully gum coating, unperforated in the size 119:98, 4 mm, fresh colors and in perfect condition mint never hinged a spectacular Soviet Zone rarity, the only in few copies have become known is! Photo expertize \"genuine and immaculate\" Dr. Jasch BPP. 6158 112PI 10 Pfg. Dark reddish brown, proof on white gray, ungummed cardboard paper, size 45:48 mm, fresh colors in perfect condition. 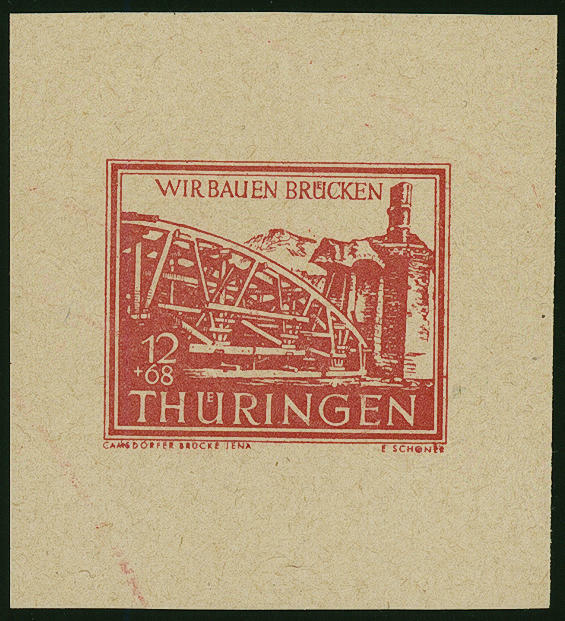 This proof served as single clichê for the later printing the bridges building stamps. He counts to the large rarities of the SBZ and becomes due to missing offers also in the Michel special catalogue only noted without price! Photo expertize \"genuine and immaculate\" Ströh BPP. 6159 113aPI 12 Pfg. Bridges building 1946, proof in pale red on white gray, ungummed cardboard paper, size 45:50 mm, fresh colors and in perfect condition. 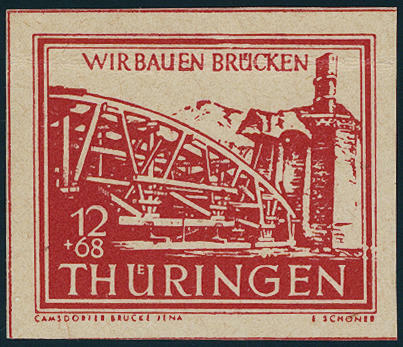 This proof served as single clichê for the later printing the bridges building stamps. A significant rarity of the SBZ and due to missing offers also in the Michel special catalogue only noted without price! Photo expertize \"genuine and immaculate\" Ströh BPP. 6160 113aPI 12 Pfg. 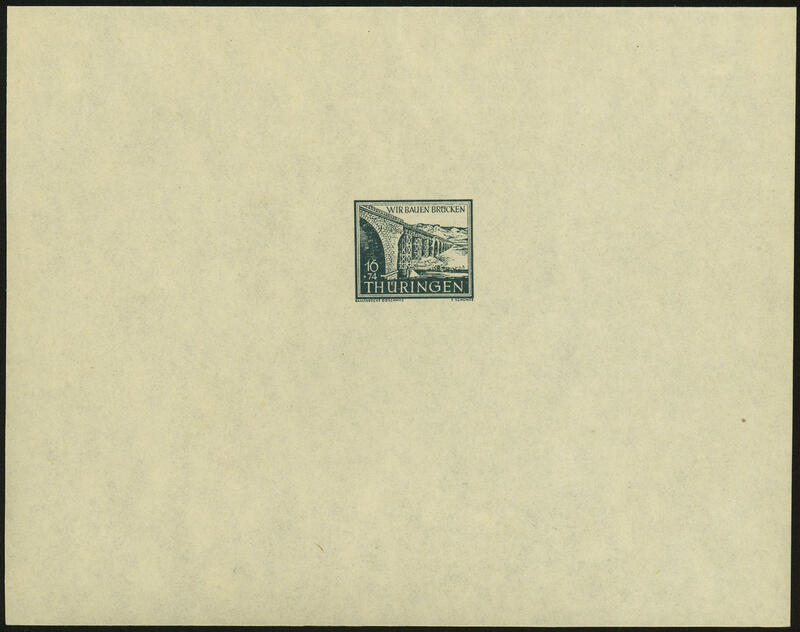 Bridges building 1945, proof on white gray cardboard paper, ungummed, fresh colors and with wide margins, horizontal crease, there are only few examples from this known. A Soviet Zone rarity! Photo expertize Dr. Jasch BPP. Due to missing offers in the Michel special catalogue only noted without price! 6161 114P 16 Pfg. 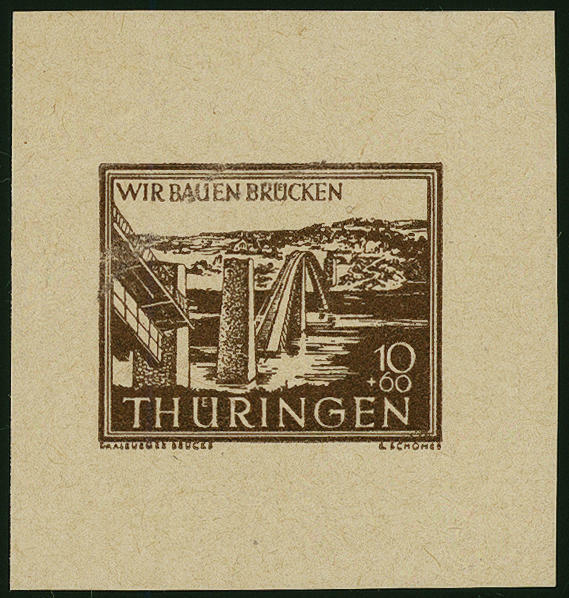 Bridges building, proof the Ohlenrothschen printing plant in Erford in black blue green, wonderful fresh colors, two small affixed spots in of the gum are maybe manufactured, a large SBZ-rarity, there only four further examples from this known are. Photo expertize Ströh BPP.